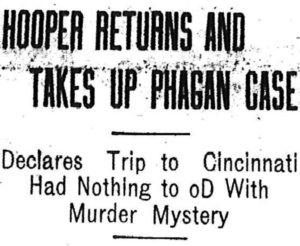 Frank A. Hooper, the experienced prosecutor, who has been engaged to assist Solicitor Hugh M. Dorsey in the trial of the case against Leo M. Frank, returned Thursday from a three days’ trip to Cincinnati, and set at rest the rumors that he went to the Ohio city on a matter connected with the investigation of the Phagan murder mystery. Mr. Hooper declared that his private business called him to Cincinnati, and that his trip was in no way connected with the Phagan case. While away Mr. Hooper states that he did not see Solicitor Dorsey nor did he see Attorney Thomas B. Felder, who went to the same city on a matter, which he said before leaving, was not connected with the Phagan case nor with the famous dictograph episode. Mr. Hooper declares that so far as he knows there are no new developments in the Phagan mystery. Mr. Hooper would not discuss the testimony of Mrs. Mima [sic] Formby, who returned to the city Tuesday after an absence of several weeks. Mrs. Formsby [sic] made an affidavit for the detectives in which she alleged that Leo M. Frank phoned her residence at 400 Piedmont avenue, a number of times between the hours of 6:30 p. m. and 10 p. m. on the evening of the tragedy, and each time begged her to let him bring a girl to her house. It is considered improbable, however, that Mrs. Formsby will be called as a state’s witness when the case against Frank is tried, for it has been known from the first that her story did not fit in with the theory of the state as to Frank’s actions on the night of the tragedy. The fact that Mrs. Formsby had returned to the city first became known to the detective department, when she phoned headquarters that practically all of the furniture left in her apartment had mysteriously disappeared. Detectives Chewning and Norris were assigned to the search for the missing furniture, which has been located in the storeroom of a justice of the peace. This official declares that a number of creditors of Mrs. Formsby, including her grocer, brought suit in his court with the result that an attachment was issued and the furniture levied upon and brought to the court. Chief of Detectives Lanford states that about twenty witnesses will be dispensed by the state for the Frank trial, and he gives it as his opinion that not more than four days of the court’s time will be consumed in the taking of testimony on both sides. The detective head is of the opinion that the case will come to trial definitely on June 30. The detective chief adds his opinion that it would be an unwise move in many ways for the defense of Frank to effect a postponement of the case. Attorneys throughout the city have expressed unusual interest in The Journal’s exclusive story telling that very probably Reuben R. Arnold will be associated with Luther Z. Rosser in the defense of Frank. The combination of these two lawyers against Solicitor Dorsey and Frank A. Hooper will insure [sic] a legal battle which would be of great interest even if the case on trial itself were not so notorious. Mr. Arnold is not associated with the defense as yet, it is said, but it is known that efforts are being made to induce him to enter the case in defense of Frank. Previous post: Will Reuben R. Arnold Aid Frank’s Defense?